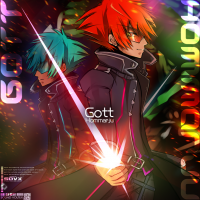 A remixed long version of Gott, titled Zusammenbruch of Gott, appears on the SOUND VOLTEX ULTIMATE TRACKS -LEGEND OF KAC- album. Gott is featured in the medley KAC 2012 ULTIMATE MEDLEY -HISTORIA SOUND VOLTEX-, from SOUND VOLTEX III GRAVITY WARS. 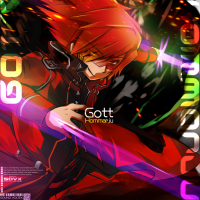 Gott appears as part of FLOOR INFECTION Medley from SOUND VOLTEX×jubeat, which appears in jubeat Qubell. Gott is a song part of the KAC2012 Original Song Contest (KAC2012オリジナル楽曲コンテスト). It was added to SOUND VOLTEX BOOTH on November 29th, 2012. Its charts can be purchased for 60 BLOCKS for ADVANCED, and 250 BLOCKS for EXHAUST. Gott's jacket features Tsumabuki Right. Gott is German for "god". Gott has been associated with May 10th (5/10 can be pronounced "go/to"), with the date being dubbed "Gott day" (Gottの日) in a similar fashion to Onigo. Playing Gott on May 10th will give the player bonus PACKETS and BLOCKS. Gott is one of the songs in Part 9 of FLOOR INFECTION. During its periods of availability, it can be unlocked in the jubeat series by playing 5 rounds of the corresponding SOUND VOLTEX series game to raise the infection level to Level 2 MAX. For more information on the dates it can be unlocked, please see the event page. From November 15th, 2018 in jubeat festo, it can be purchased using in-game currency. Gott marks the first appearance of Hommarju in jubeat. Gott's SOUND VOLTEX NOVICE/ADVANCED/EXHAUST jacket is used as the jubeat series' jacket. Gott received an INFINITE chart in SOUND VOLTEX II -infinite infection- on August 21st, 2014. It can be unlocked via INFINITE BLASTER. Contest Winner Songs Max Burning! !